BRIAN HEAD – Residents in nearby cities woke early Sunday morning to the effects of the Brian Head wildfire as dense smoke spread far and wide. The smoke from the 42,000-acre fire is reported to be impacting nearby communities and states, particularly in the early morning hours when inversions settle into valleys, but then breaking up around midmorning. Those who may be sensitive, particularly young children and the elderly, should consult with their health care provider and limit exertion outdoors. Meanwhile, the fire itself only spread 2,600 acres through the night, the lowest increase reported since last Tuesday when the fire jumped from 500 acres to 1,000; it has been more than doubling in acreage every day since. The Brian Head Fire is now considered not only the largest fire burning in the state but also in the nation as dead wood throughout the forest continues to fuel the flames at an “unprecedented” rate unlike any fire officials say they have ever seen. Saturday night at 8:30 p.m. the fire was reported at 41,148 acres growing to 42,800 overnight. The fire is currently just 8 percent contained. Eleven helicopters, 41 engines and 29 crews comprising of 996 firefighters are working around the clock on the blaze. Multiple spot fires were reported on the south side of Highway 143 near Mammoth Creek and Prince Mountain Saturday afternoon when the winds spread embers across the road. Firefighters quickly responded and minimized the spread of these fires. Through the night, firefighters continued work on containment of these spot fires. Upper-level moisture will moderate weather conditions over the fire area today. Winds are expected to be calmer, though still from the west/northwest. Monday, there is a slight chance of thunderstorms, and winds will shift back to the predominant southwesterly flow. A Red Flag Warning indicating high fire risk conditions is anticipated for Monday as well. Monday, a Type 1 Incident Management Team will assume control of the eastern half of the fire. The Type 2 team will remain in Parowan as the two teams work together to protect the values at risk and coordinate the full suppression of the fire. The Type 1 team will be based at the Triple C Arena in Panguitch. Rumors about the fire have continued to spread with the most recent being that charges have been filed and the individual allegedly responsible for starting the fire with a weed torch is in jail. However, Iron County officials have confirmed that this matter is still under investigation and as of today, no criminal charges have been filed nor is anyone in jail. Current Evacuations – The following communities remain evacuated per local law enforcement: Panguitch Lake, Horse Valley, Beaver Dam, Castle Valley, Blue Springs, Rainbow Meadows, Mammoth Creek, Dry Lakes, Second Left Hand Canyon, and the town of Brian Head. Evacuees can contact the Red Cross for shelter information. If you live in an area affected by wildland fires, officials recommend familiarizing yourself with the Ready, Set, Go Program. Closures – Highway 143 is closed from the cemetery in Parowan to milepost 50 outside of Panguitch. Mammoth Creek Road is closed at the junction with Highway 143. The north side gate of 143/148 is closed. The Dixie National Forest has expanded its area closure. Please check your route before planning recreational activities. Maps and a thorough description of the closure area are posted at inciweb.nwcg.gov. 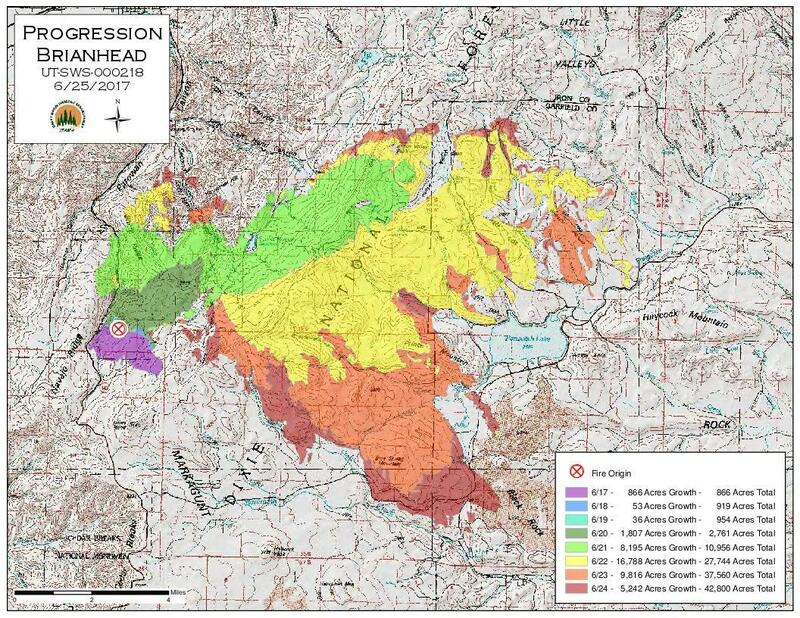 The Brian Head Fire started around midday Saturday, June 17, and grew very quickly through dense timber on lands administered by Brian Head Town, Iron County, in cooperation with the Utah Division of Forestry, Fire, and State Lands. 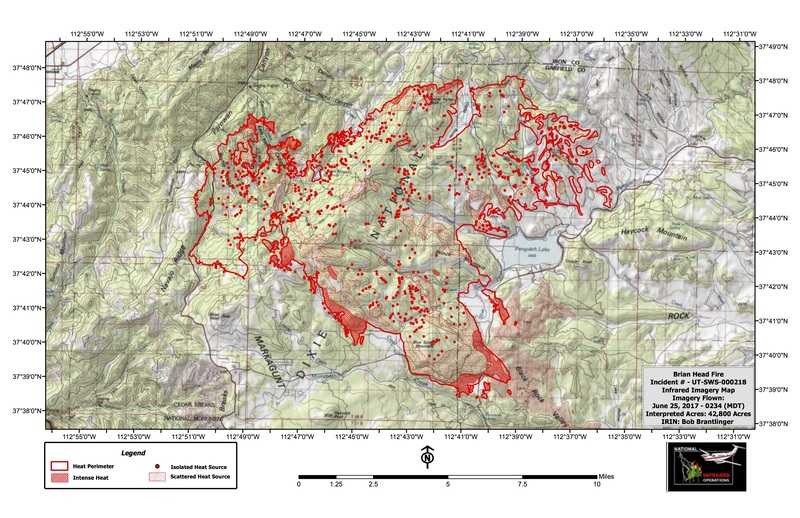 It has since burned onto lands managed by Dixie National Forest and Color Country District Bureau of Land Management. Cedar Breaks National Monument remains open, with access via Highway 14.